Animal Wallpapers > Squirrels > Pure Trouble ! I have a soft spot for squirrels they can be so much fun! 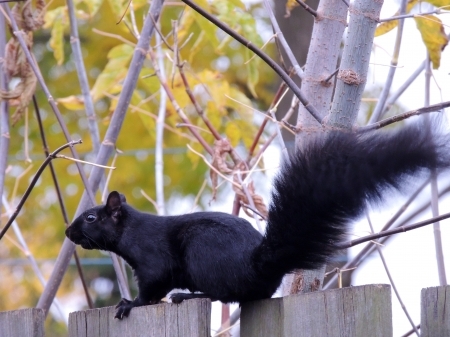 ... but lately the black squirrels in my neighborhood have taken to raiding people's garbage. For some reason, they are leaving a lot of it in my back yard! I could put up with it except that they've been leaving all sorts of food items... anything from cookies to old burritos. Our collie is on a special veterinarian diet out of necessity... and we're having an awful time getting to this food before Katie does. Any of it could make her sick!